Whenever the major stock indexes come under selling pressure or even have a correction there are a few stocks that seem to be safety stocks. These are stocks where investors will immediately flock to and park their money in order to weather the storm. These stocks are Procter & Gamble Co. (NYSE:PG), Colgate Palmolive Co. (NYSE:CL), Johnson and Johnson (NYSE:JNJ), and Coca-Cola Co. (NYSE:KO). These are stocks that make products that very few people can live without. All of these stocks distribute dividends and are held by many leading mutual funds. Therefore, whenever the stock market starts to sell off or have a market correction these stocks will see buying interest increase. 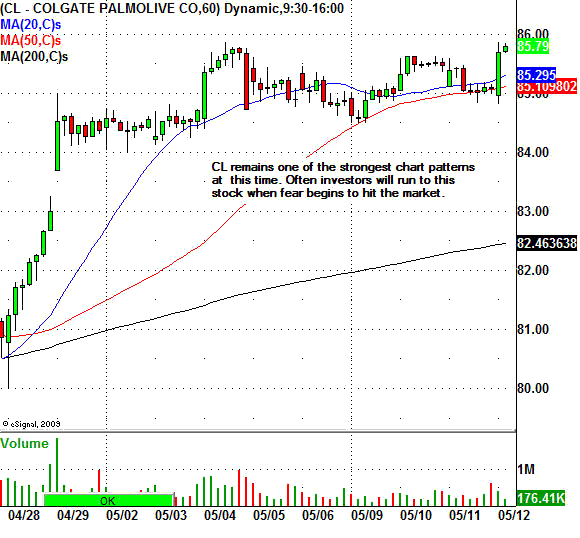 At this time, Procter & Gamble, and Colgate Palmolive have very strong daily charts patterns. These stocks are very close to trading around their 52 week highs. The current chart patterns for these stocks indicate higher prices as they are trading above all of their major moving averages.